We are opening for your service on 6th August 2009, at 158A, Subadrarama Road, Nugegoda. 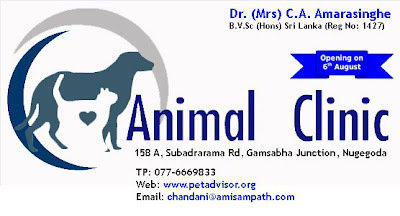 At our clinic we provide treatments & consultation for your pet, animal surgeries, vaccination, and deworming. Consultation hours are daily 9.00am to 12.00pm and 4.00pm to 8.00pm. (The morning consultation session will start from 1st September 2009). 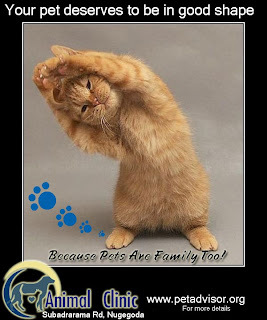 CBS) Our pets need to keep their weight in line and stay in shape just like we do, and a great way to help them do it is to have them exercise. 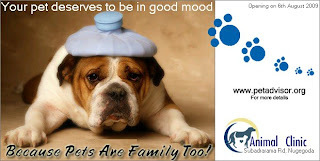 We all know the importance of maintaining the pet’s health, but whether we know about their happiness?